The judge was Jim Kacian. 142 authors, 409 haiku from 36 countries! The theme – FREE. to look into your eyes . . .
a few more times . . .
Our Haiku Association „Three Rivers“ is in the town Ivanić-Grad and every Autumn we have a “Pumpkin Festival”. 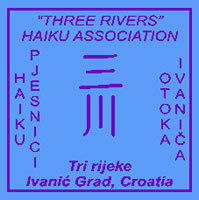 Meeting of Croatian Haijins and the competitions for haiku are a part of this happening.